Memory loss does not discriminate. Mary Ann knows first hand what happens to a family when a person suffers cognitive decline. The cost of supervision and other long-term care services can drain savings. However, affordable Long-Term Care Insurance can protect your assets while reducing the stress and burdens placed on family members. 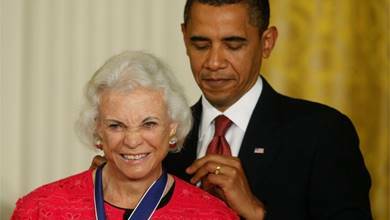 In a statement released by the United States Supreme Court, retired Justice Sandra Day O’Connor has been diagnosed with dementia, most likely Alzheimer’s. According to the statement, she will withdraw from public life. “Since many people have asked about my current status and activities, I want to be open about these changes, and while I am still able, share some personal thoughts,” O’Connor said in the statement. O’Connor was appointed to the court by President Ronald Reagan in 1981, whom himself was later diagnosed with Alzheimer’s. She said her doctors some time ago made the diagnosis which necessitated her withdrawal from public life because of her condition. 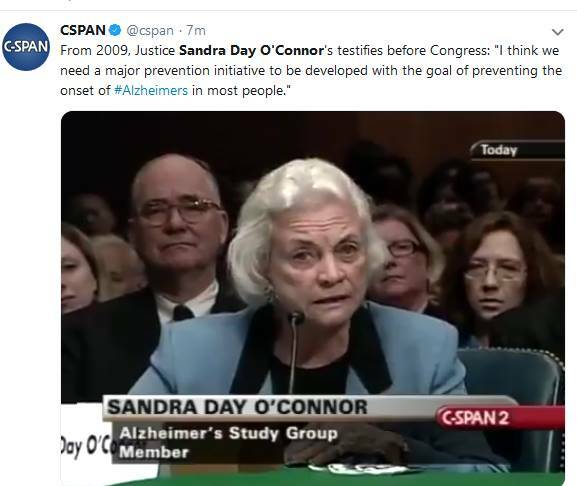 Ironically, in 2009 O'Connor along with former Speaker of the House Newt Gingrich and former Surgeon General David Satcher, were on a task force which studied Alzheimer’s and the impact it will have, because of longevity, on American families and the U.S. health care system. The report showed that Alzheimer's will overwhelm the nation’s health-care system. Today, as Generation X and late-boomers join the baby-boomers in longevity, more people will need help with everyday living activities and require long-term care services and supports. This includes supervision due to those who suffer from cognitive decline. “Sandra Day O’Connor exemplifies excellence in public service, & she continues to be a role model to women & an inspiration to young people. I am saddened to hear of my friend’s diagnosis, but not surprised she is facing it with the strength & bravery that have defined her life,” said Sen Susan Collins (R-ME). 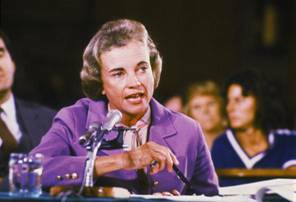 O'Connor was nominated to the Supreme Court by President Reagan on August 19, 1981, fulfilling his campaign promise to appoint the first woman to the highest court in the United States. On September 21, O'Connor was confirmed by the U.S. Senate with a vote of 99–0. On July 1, 2005, she announced her intention to retire. In her letter to President George W. Bush, she said her retirement would take effect upon the confirmation of her successor. On July 19, Bush nominated D.C. Circuit Judge John Roberts to succeed O'Connor who was later confirmed. President Obama awarded her the Presidential Medal of Freedom in July of 2009. Media reports say she had begun having issues with short-term memory and that she primarily used a wheelchair, owing to hip problems, so her public life was scaled back. The Alzheimer’s Association says Alzheimer’s is the most common cause of dementia and accounts for 60 percent to 80 percent of cases. Worldwide, nearly 44 million people have Alzheimer’s or related dementia. Only one in four have been diagnosed with the disease. Alzheimer’s ( and other forms of dementia) is one of the leading causes of long-term care.16.1 million Americans provide unpaid care for those who suffer from this condition. Paid care is substantial and drains the assets of American families. Health insurance and Medicare will not pay for most of this type of care. Those with Long-Term Care Insurance can benefit from professional care at home or in a facility. Every 65 seconds a person gets diagnosed with Alzheimer’s. The impact on family caregivers is tremendous, physically, emotionally and even financially. Caregiving is very hard on family members as they must balance their own lives, careers and family responsibilities with caregiving. This care, in addition to supervision, helps a person with normal living activities they can no longer do on their own. Generally, the needs of those who suffer from dementia are greater than normal aging care. Experts recommend Long-Term Care Insurance to be included as part of a retirement plan. These affordable policies provide tax-free resources for quality care, at home or a facility. In addition to protecting savings and income, they reduce the burdens placed on family members. Start your research by finding your state on the LTC NEWS MAP. This will show you the current average cost of long-term care services and supports, available tax incentives and the availability of partnership plans which provide additional dollar-for-dollar asset protection. Click here for the map: https://www.ltcnews.com/resources/state-information. Most states offer Partnership plans which provide additional asset protection. Federal, and some state tax incentives are also available for some people. Work with a Long-Term Care specialist who understands these products, underwriting, and claims. You can find a specialist by clicking here: https://www.ltcnews.com/contact. The best time to start planning is prior to retirement.